This Grilled Steak Salad with Roasted Rainbow Veggies + the works is my attempt to restore household equilibrium. Eight hours after we touched down in Milwaukee after a magical five days of sightseeing, visiting friends, and eating everything within a two-foot radius of our faces in New York City, Ben and I drove to the hospital for surgery. For the sake of keeping this post appetizing, I’ll spare you the medical details, but Ben had a hip operation that has put him out of commission for the next several weeks. His new “office” is our living room floor, where he’s working almost horizontally so that he can keep his hip aligned. I’m serving as defacto nurse, a position for which I am grossly unqualified. I keep bumping into Ben’s injured leg, causing him to yelp and me to apologize profusely and then offer to bake something as an apology. Never let me into an emergency room—I’ll accidentally mix up charts, then bake brownies. We spent last week in a beautiful vacation world, where pasta doesn’t have carbs, pork buns at midnight are the equivalent of exercise, and days cannot begin without croissants. This week, my suitcase is still in the middle of our bedroom, we’ve been surviving on an odd combination of shredded wheat and frozen turkey burgers, and my husband can’t pull up his own shorts. It’s been a time of extremes. Tonight, I want to take a deep breath, ignore the opposing ends of the spectrum, and relax dead center with a glass of wine. Even choosing red or white wine seems too committal—bring me the rosé. Grilled Steak Salad with Roasted Rainbow Veggies is my equilibrium meal. It’s healthy with a does of indulgence, hearty without being heavy. In a single bite, I can taste the sweetness of caramelized roasted root vegetables, the savoriness of grilled sirloin, the creamy punch of blue cheese, and the salty crunch of pistachios. This is the grand yogi master of salads. To make the salad, I started with a gorgeous mix of rainbow beets and carrots. No matter how stretched I’m feeling, just looking at these colorful veggies fills me with appreciation for the small beauties that surround me every day. If you are not a carrot or beet fan, I imagine that roasted sweet potatoes, broccoli, cauliflower, and even Brussels sprouts would taste lovely too. The sirloin steak is simply seasoned with olive oil, salt, and pepper and takes less than 6 minutes to grill. Though I don’t choose red meat as often as I do other options, I enjoy sirloin because it’s fairly lean and super versatile. Nestle the grilled steak on top of mixed greens, pile them high with roasted veggies, and then finish the salad with a sprinkle of blue cheese and pistachios. I intended this grilled steak salad to be the comfortable average between vacation extravagance and weekday doldrums, but, as you will see, the final effect of its layered flavors and textures is anything except ordinary. 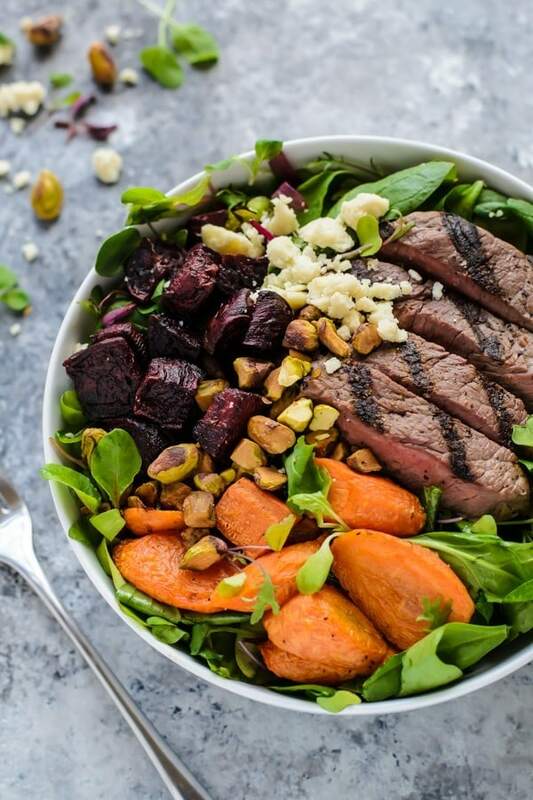 A gorgeous and flavorful grilled steak salad with roasted vegetables, blue cheese, and pistachios. The perfect mix of healthy and indulgent! Place oven racks in the upper and lower thirds of your oven, then preheat the oven to 400 degrees F. Peel the beets then cut into 1-inch chunks. Spread in a single layer on a baking sheet and drizzle with 2 teaspoons olive oil, sprinkle with 1/4 teaspoon kosher salt, and 1/8 teaspoon black pepper. Place in the oven and roast until fork tender, 35 to 40 minutes, turning once or twice throughout. Meanwhile, peel the carrots and cut into 1 1/2 inch diagonal slices. Spread in a single layer on a second baking sheet, drizzle with 2 teaspoons olive oil, sprinkle with 1/4 teaspoon kosher salt, and 1/8 teaspoon black pepper. When the beets have been in the oven for about 15 minutes, place the carrots on a second rack in the same oven and roast until fork tender, about 20 minutes. Turn the carrots once or twice throughout and rotate their position in the oven with the beets so that the vegetables cook evenly. When the vegetables are done roasting, remove from the oven and set aside. To cook the steaks, first remove from the refrigerator and let come to room temperature. Heat a grill or a heavy cast-iron skillet over medium-high. Pat the steaks dry, brush well with olive oil, and season liberally with salt and pepper. Grill steaks for 2 to 2 1/2 minutes on each side for medium rare or 3 minutes per side for medium, or until the steaks register 125 degrees on a digital read thermometer. Remove to a plate and cover with foil. Let rest for 10 minutes, then slice. Place greens and roasted vegetables in the bottom of each serving bowl and top lightly with dressing. Toss to coat. Top with the sliced steak, crumbled blue cheese, toasted nuts, and a little extra dressing as desired. Serve immediately. I am sharing this post in partnership with Omaha Steaks, whose sirloin steak and vegetables I used to develop the recipe. You can also find this recipe on the Omaha Steaks blog, where I am a contributor. As always, all opinions are my own and thanks for supporting the brands who make it possible for me to continue to provide quality content to you! YES I DO. I miss you lady! I hope Ben recovers quickly and smoothly. You are a great wife :) This salad is perfect and should be enjoyed with that bottle of wine. Hope Ben recovery goes well and he feels better soon. Love this gorgeous salad! It looks perfect! This salad looks really good!! Yummy!! I’ll be praying for Ben! Y’all take care and have a great weekend! So sorry to hear about Ben’s surgery. It was good you could have a fun week in NYC prior to it. Hope those happy memories are helping during this period. Hope he’ll be back at 100% soon! I’m sure this gorgeous salad will help speed up his recovery!Thanks for the great recipe. I was just trying to think of a fun week-end dinner; this will be perfect! Best wishes to you and Ben!! Really gorgeous salad, Erin! I hope Ben’s recovery goes well. I’m sure you are an excellent nurse! I’m sorry that your husband’s sick, but its great that you fit in the good vacation before it all went down. NY has the best food! And this salad is phenomenal. Those veggies have so much color! Oh my! I hope Ben recovers soon and equilibrium is restored! I happen to love roasted beets and this salad looks perfect! I love this steak salad! It combines two perfect worlds, steak and salad! Love all the greens! Oh boy, this sounds so familiar. I remember playing nurse when my hubby broke his leg and had surgery. I don’t think it was very fun for either of us. At least there’s always brownies and this gorgeous salad! You almost made me spit out my coffee with the vision of you in the emergency room with your apology brownies. I so relate! And what a gorgeous salad! I love that it’s relatively light, but totally satisfying. geez AND I’m so sorry that your husband had to have surgery. I hope is recovery is quick and complete!! Also, this salad looks delicious! Hope he has a quick and easy recovery! I’m loving the colors and vegetable choice in this salad… such a great combo, especially with the pistachios :) PS I just stumbled on your blog and I am LOVING it! YAY Liz! So nice to “meet” you and glad you found my blog. Thanks for the warm recovery wishes too! Love love loooove the look of this salad! It’s filled with so many delicious colours and ingredients – The beetroot looks sooo stunning! I adore your photographs too, they’re absolutely beautiful! Ashely, I can’t even imagine! You are a champ. This salad sounds wonderful Erin! I love the rainbow roasted vegetables! Hope your husband will be feeling better soon! This salad is simply beautiful! I lingered on that picture of beetroot for about 5 min – such gorgeous colours. Love the sprinkle of blue cheese at the end – I can imagine it gives a delicious umami saltiness. We were on vacation two weekends in a row, and so the actual work week made for interesting lunch and dinners…and OMG did we enjoy the vacay food. This salad is so something I need in my life. I told my husband the other day after all our indulging that I just missed vegetables! I hope your husband recovers swiftly, and safely – hip surgery sounds painful. Yes Nicole! I came home in need of some serious veggie intake too. Hope that you had wonderful travels with your family! I love colorful salads! Yours looks gorgeous. And your pictures are very beautiful. Awww. I’m sorry to hear about Ben’s surgery and hope his recovery goes smoothly. My husband was in bed for 5 months – working horizontally, while I played nurse and single parent. I know from experience that it is not an easy job and not a picnic for either one of you. Take care – both of you. Now, to the food… This salad is perfect. Truthfully, I haven’t met a steak salad I didn’t like, but your combination of ingredients appealed to me tonight. And the photos? Beautiful! Thanks for a lovely post, and again, I wish a speedy recovery. 5 months Kim?? I can’t even imagine! You must truly be super mom and super wife. Thanks so much for your kind words, and sending good thoughts to your family too! Sending fast recovery thoughts to the hubby! My boyfriend is one of those people who says “salad is what my food eats” but I may be able to entice him when there is steak involved…love this idea!